Inception Longboard - Jason Livingstone. Following on from last years Adrenalin 360 Surf & Skate inaugural comp, all who attended the now 2-day event agreed that it was a huge success. With support from Pittwater Council and their Enliven Pittwater initiative, The Chamber of Commerce, Avalon Surf Lifesaving Club, Avalon Bowls Club, Charities, shops and business, it was truly a community event. With over 200 competitors, their families and friends, Avalon certainly had a carnival atmosphere. And the surf didn’t disappoint either. It was equal to the event with near perfect conditions with 4 and 6 footers coming through. With the swell looking to pick up over Saturday to quite amazing conditions on Sunday, the younger Groms competed on Saturday. The standard of Surfing was indeed impressive. Competitions throughout the day such as the Crumbed Cutlet and Sand Castle Building, kept everyone entertained. With some of the best surf seen in Avalon for some time and the conditions at South Avalon too messy, the 14 to 16 Groms joined the Avalon Inception Longboarder Competition at North Avalon. And what a spectacle it was! Longboarders and Groms mixing it up with 12 competitors out there at any one time. With the surf just getting bigger throughout the day it was a delight to witness. 360 Surf event director Mark Radford summed up the comp, “Exciting, fun and the Groms standard was just amazing”. Over at the skate park it rocked. At some stages there were over 300 spectators and competitors looking on to see the action. Which again was impressive. Between heats, the Adrenalin Team Riders created more than a few gasps from the crowd with their stunts on Skateboard & Scooters. 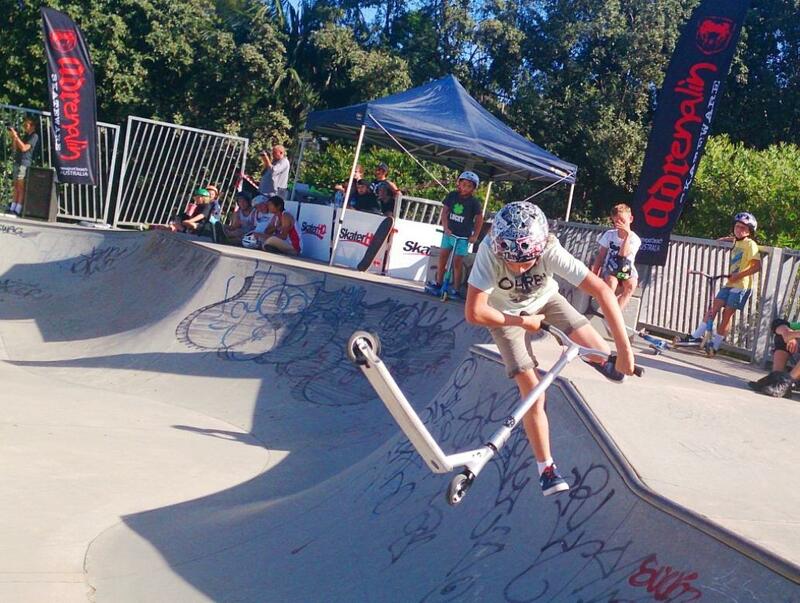 This was the first time a Scooter Competition has been held at Avalon. It attracted the likes of Coedie Donovan the Australian Champion and Pro Riders from Madd and District. For those kids that Skate & Surf they competed to become King or Queen of Surf & Skate. Last years Queen U16 Zoe Ifield won again, with Wade Clemens under 14 King and Nica Frane U14 Queen. Another great surfing name, Jack McCoy presented a fascinating overview of his inspiring film ‘A Deeper Shade of Blue’. With live music from the period from local band Surebreak, Historical Australian Surf Films, food and good cheer, it was a great end to the first day. Adrenalin Inception Longboard Completion Sunday North Avalon Beach. This was a new event for Longboarders. With seven divisions and over 50 competitors it was a very busy day especially with the older Adrenalin 360 groms joining the surf. With several Australian Champions such as Jason Livingston, John Skinner and Christian Pimm joining the competition, there was some awesome displays of talent and skill. In the words of the event director Phi Nicol, “INCEPTION 2014 was an unquestionable success and will be remembered by many as a progressive and innovative event that will be a valuable addition to the Longboard surfing calendar”. Surf 360 - Darcy Crump. Report by Joshua Axford, 2014.